So I’ve never used my Shapeoko XL (Dewalt 611) to mill plastic. Can anyone with some experience in this area chime in? I am planning to use 1/8" 2 flute square endmills. I have a 5mm sheet 24"x24" of black ABS. The ABS sheet (even at 5mm) is fairly flexible, is there another plastic that is stiffer? I also have acrylic but that is far too brittle. I can also get HDPE and Polypropylene at around the same price. I’m making enclosures for electronics. I would like something fairly stuff but not nearly as brittle as acrylic. I have a Nomad and have great success milling HDPE. It seems to work with a pretty wide range of RPMs and cutters without melting the material. It can also be self tapped with standard screws and bolts, which would make it ideal for enclosures. With ABS, I would worry about the DeWalt being slow enough not to burn the material. You could of course get around this with a single flute endmill or coolant. Can you apply any type of finish or polish HDPE? As far as finishes, HDPE can be ordered in any color, but it’s a non-stick surface and probably wouldn’t hold paint (it is used for food cutting boards.) It usually has a glossy finish. It looks nice to me after machining. The tool marks will be very smooth. Threaded inserts could be easily press fit. I would try it first with a hole the same size and see if that allows enough room for expansion to create a nice friction fit. A good example of what can be done with HDPE is ironically Carbide3D’s competitor Othermill. Their whole machine frame is made from it. Proper hold down technique is key, for any material, as the cutter will try to lift the work. Plastics (acrylic, ABS, HDPE, etc) all tend to be worse than most metals due to low stiffness and tendency to creep, as well as tendency to being grabbed by the tool more easily. Techniques have been discussed here many times, and include tape (double sided and masking tape with superglue are both popular), fasteners directly to wasteboard (screws through drill points for the final product and/or waste areas) vacuum holding (pretty much the best, but not easy to set up), clamps and bars (cauls) to spread load (easy, but needs care to avoid the obstacles during machining, and the clamps/cauls often need re-positioning to get to areas they block), and a number of others. As to material for an enclosure, ABS isn’t terrible to machine, but acrylic, polycarbonate, HDPE, nylon, and acetyl (delrin) are all easier. 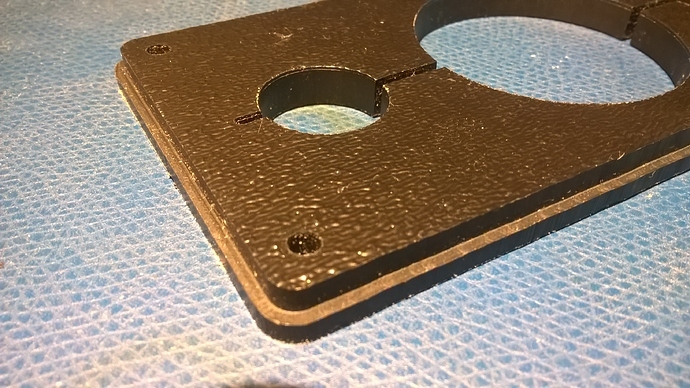 For enclosures, ABS is a good choice, and HDPE isn’t bad either. Acrylic sees a fair bit of use in the universe I am in, due to transparency, and holds up well. Tapped holes or nuts are used for acrylic, whereas HDPE is pretty ok with self tapping (thread forming) screws, and ABS is ok with the correct type of self tapper (thread cutting). As for stiffer plastics, there was a recent discussion. Take a look at that thread for more info, but, to summarize, unless you want to bump cost up a lot, the stiffest materials are all in the ballpark of acrylic. Fibre reinforced materials are much stiffer, and high-priced specialties like PEEK are a good bit stiffer. Best advice I can give you is: don’t overthink it. Unless it is going to do harsh service like space, sub-sea, crash testing, etc. pick the material for the desired appearance and cost, as machining doesn’t differ much. I’ve been cutting a lot of ABS sheet lately, both 4.5mm and 6mm haircell ABS. The 2 flute flat square cutters from Carbide work well. Since some of my jobs have finer detail, and because changing tools is a hassle, I’ve been used 1/16" dia exclusively. I run my Makita at 2.75, so around 16000 RPM (That’s ‘1’ on the DeWalt I think). Cutting at 800mm/min with 1.2mm max depth. No issues so far cutting slots, boring holes, milling pockets and contour cutting. Apart from being easy to mill, I like ABS for paintability, heat forming, and also because it takes plastite screws very well. @yug Would you mind sharing any pictures of your pieces? I’m cutting 4.5mm haircell as well. I’m just curious as to how the edges come out. How do you clamp it down? I clamp the edges of the sheet (I work with 2’ x 4’ sheets one end at a time to avoid cutting down material) then place a couple of heavy weights just outside the cutting area. Material generally lays quite flat. Long-term though I plan to make a vacuum fixture. Edges are OK, though I’m now seeing some “chatter” in only the X-axis direction. I need to check bearings on the X axis. The slot between the holes in the photos is 1/16" wide and full-depth. That looks good to me. Inside the circles looks incredibly smooth. Do you consider the haircell side to be the finished side? I noticed that the other-side scratches extremely easy. Any guess on what your total cutting time is like on that part? Yes. Haircell is finished side. Even before I handle it, the backside of the ABS sheets look pretty rough. On some projects where the back-side is exposed or used, I apply sign vinyl (outdoor permanent adhesive) before cutting. Here’s an example: https://www.voltwerks.com/products/base-board-170x230mm. Not sure if that applies to your situation. 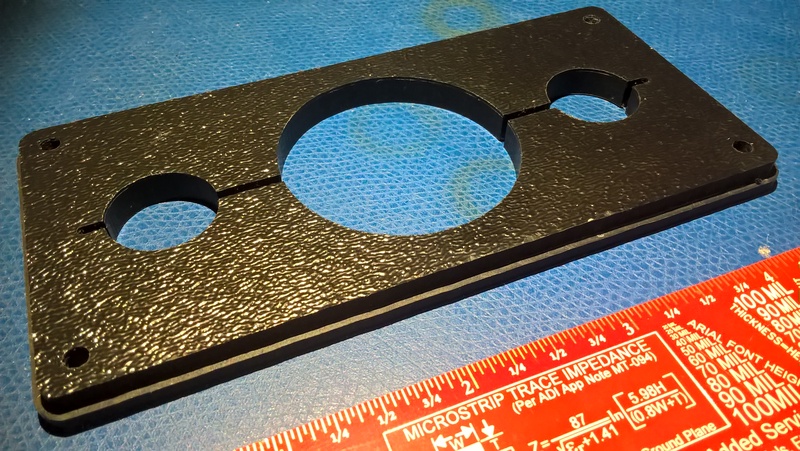 Fusion 360 CAM estimates 2m44s for this piece, so in reality it’s 3-4 minutes. Two basic flavours of self tapping: screws that cut the thread, like a conventional tap, and those that form the thread by displacing the material. They each come in an assortment of types, but the thread cutting are generally pretty obvious. Sheet metal “self drilling” screws are generally not good for plastic (and are thread forming), but other sheet metal screws can be used in some applications, though those made specifically for plastic tend to do much better. Can anyone suggest a different type of plastic that doesn’t have the haircell finish? I’m building an electronics enclosure and would prefer something smooth and somewhat scratch resistant. Smooth can be had in acrylic (“plexiglas”, etc), ABS, Styrene, PVC sheet (solid or void filled), polycarbonate, Acetyl (delrin, etc), or pretty much any other thermoplastic or thermoset you want. For PVC or acrylic, a home center/hardware store will have it. Both are cementable. Acrylic needs tapped holes or inserts for threaded fasteners, as it is at the brittle end. Polycarbonate (“Lexan”, for example) is similar to acrylic, but tougher and more scratch resistant. Machines ok, but not my favourite. ABS can be had from plastics suppliers, some hobby stores, industrial suppliers, and so on. Cementable and easily heat fusable (plastic welding tool- a glorified soldering iron at the cheap end- work ok, but I usually friction weld using a die grinder. Smooth mandrel if no fill is required and a rod of matching material if fill is needed. A lot like welding metal, actually). Acetyl is nice, but pretty much needs mechanical fasteners. Available from plastic houses and industrial suppliers. HDPE- similar, but less stiff than acetyl or nylon. Hides scratches well, for a plastic, on most surface finishes except dead smooth. Adhesives and paints are not compatible. Tis is what many milk jugs, laundry detergent bottles, and many other are made of. I have been cutting Acrylic and Polycarbonate with my S3xll It took awhile to make this work. I ended up using a ball end mill 2 flute up-cut for all my cutouts and holes. It never gums up and gives me an almost polished edge. I have to cut a bit deeper into the washboard not to get a sharp edges from the Ball nose cutter. It works for me because I do edge light signs so a round edge is nice, but that may not work for you. The best results for straight end mills have been single flute up cut and a bit of DW-40 for cooling and lubing, or run compressed air to the Mill end.Feed and speed is where it is. I run the Dewalt at 1, feed at 1100 and plunge at 250. on a 3.1mm end mill.